Cembre 2A range of high voltage copper crimp lugs are suitable for 11kV to 33kV cables. The extended cable lug barrel provides excellent connection to stranded copper conductors. The 2A lugs can be installed using Cembre ME hexagonal die sets. Cembre 2A heavy duty copper tube terminals are made from high purity copper tube and annealed. Cembre 2A cable lugs (11kV-33kV) feature a double length barrel for improved electrical and mechanical performance in high voltage systems. The abscence of an inspection hole prevents the entry of water or moisture into the crimped connection. 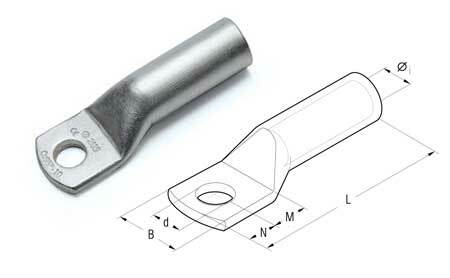 Water blocked cable lugs are suitable for outdoor crimping applications. Cembre 2A high voltage copper cable lugs are electrolyticaly tin plated to prevent atmospheric corrosion. Cembre 2A2M double stud, 2 hole high voltage cable lugs are available for 11kV-33kV cable terminations. Cembre 11kV-33kV cable lugs are suitable for terminating high voltage (HV) stranded copper conductors to BS6360 Class 2. Cembre lugs are suitable for terminating and crimping both 11kV-33kV cables indoor and outdoor due to absence of conductor inspection hole. Cembre 2A lugs are crimped using Cembre hydraulic crimping tools (HT51 up to 240sqmm or HT131-C up to 400sqmm). Cembre 2A copper cable lugs are short circuit tested to BS4579 Part 3 for high voltage 11-33kV cable crimping termination.